And looking at the project, it was pretty clear that mom had done most, if not all, of it. How exactly am I, as the teacher, supposed to grade that? Before I had kids of my own, I was completely mystified by this behavior. And, of course, as a teacher, it drove me batty. At one point, in an effort to get parents to stop doing this, I even offered to let parents turn in their own projects if they really felt the need to do them (I even offered gold stars, but alas, no takers). Now that I am a parent myself, I totally get it. Of course, I can do a better job. I understand sequencing better than my child, and I have better research, art, and writing skills. I’m an adult, after all. And I want my child to do well. But that’s not really the point, is it? The point is for the child to learn these skills, even if part of the process means getting a C- instead of an A+. So, for your child’s sake (and your child’s teacher’s sake), hands off! That doesn’t mean you can’t help at all, of course. Kids do need guidance – that is part of the learning process, and they can’t very well drive themselves to the library. The trick is knowing when to help and when to steer clear. So, to help discern what is helping and what is doing, I have made this handy-dandy chart, which you can download in printable format here. Plan out a schedule with your child with times and days for getting each part of the project done. Make a plan yourself, and then write the times and dates in your child’s planner or calendar. Take your child to the library. Teach him how to use the catalog to search for books. Tag along as he finds the books he needs. Take your child to the library and look up the books he needs on the computer while he watches. Get the books while he tags along. Suggest search keywords for computer research. Help her print out the information she finds. Type in keywords, find sites, and print them out while your child watches. Ask questions about the way your child is organizing his projects. Point out places where things seem confusing. 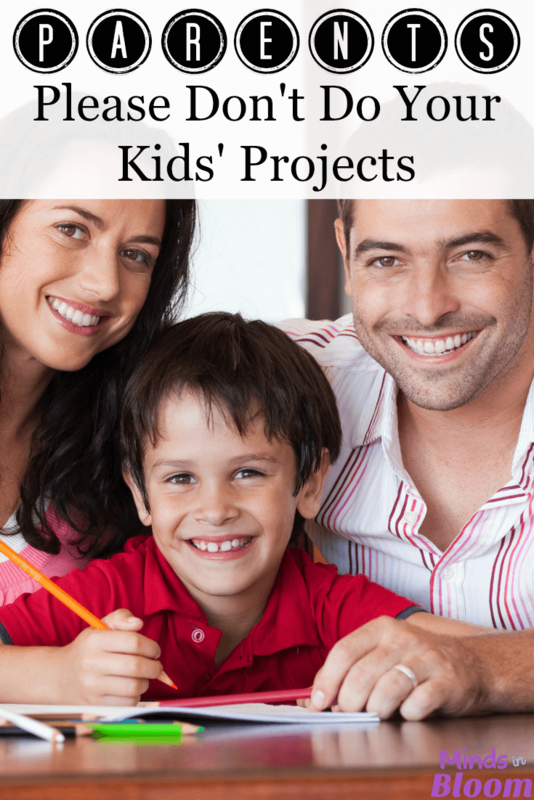 Organize or outline your child’s project for him. Edit your child’s work by pointing out spelling/grammar errors, sentences that are unclear, etc. Correct the mistakes in your child’s work and rewrite as you see fit. Buy supplies that your child might need, like a 3-fold display board or art materials. Create elements for the project, such as pictures, logos, diorama scenery, etc. Ask questions about how your child is choosing to arrange things, about information included, etc. Require your child to rearrange or add things. Do it for your child. Observe, advise, and help with things that your child cannot do by herself, such as use an electric drill or drive to the library. Do anything that your child can do herself, even if you can do it better. Even if it will look, sound, be better if you do it. Even if you really, really want to. *BTW M. Hopper, if you ever happen to read this (which seems highly unlikely), that was your kid! Love this! Drives me crazy when parents do the work for them! Would you share a downloadable copy of your chart? Beth, I just made a printable version which you can download from the post. Thanks for the suggestion! I do not have a Valentine box contest because there are so many parents who create this lavish Valentine box because they know their kids are in a competition . I like to see a third grade child's work. Not a 30-year-old adults work. . I'm a sole parent of 4, aged 12, 9, 5 and 3. I also work full time in a professional capacity. I don't do my kids' homework or school projects for them. Hell, half the time I'm too busy to keep up with all the pointless homework they're given. And my kids seem to be doing reasonably well at school. BUT. Here in Australia, there's a debate in progress about the ridiculous amount of homework children are given, and whether or not there are any gains to be made by inflicting this homework on children. The 'experts' appear to have formed the view that homework in primary school is pointless and actually detrimental to a child's life. Why? Because kids work hard at school all day. And their parents work hard at paid jobs all day. And then everybody gets home at the end of the day, and there's no family time and no down time because of the goddamn homework. Kids are screaming because they don't want to do their homework, parents are screaming because it's getting late and they're too tired and busy to do the homework, and the atmosphere at home every evening is horrible. Here's a newsflash: most parents don't have time to take their kids to a library during opening hours. Most parents don't have time to walk their kids through how to do a school project. They do the projects for their kids because the alternative is night after night of trying to force kids to sit down and focus at 8:30pm, when everyone's tired and fed up and homicidal. The answer is to stop the homework and ridiculous projects, extend school hours to mirror the working day, and get the school work done during school hours. I teach 4th grade and I can agree that students spend too much time on homework. The homework I assign should take no more than 30 minutes at the most. I tell my parents that if its not done by that point to stop the child working on it and send me a note. I've obviously missed teaching something to that student. The irony of your comment about assigning no homework whatsoever is that I have parents who actually ask for more homework. Okay, you had kids but you still don’t get IT! As a single parent and teacher myself, I RESENT these projects that elementary kids are assigned which they do not have the skills for. Let them get a C-? How is that going to affect their motivation. NOT! I did all that work for that grade? As a parent, you want your kids to succeed and you want to help them. However, the key word is help! Help always turns into doing because your must spend so much time showing them how to do everything until you want to explode! I have been to school. A LOT of school I shouldn’t feel guilty because I don’t want to feel like I am in school again. Your clueless lady!!!! Assign projects that are appropriate to the grade level and experience which will allow them to learn. I’ll stop helping on my kid’s pricey trifold time wasters when teachers quit grading on “pretty”. No child’s project should have more than $20 dollars plowed into it TOPS. So far I’ve chucked out $300 this year alone in supplies because the bulk of the grade was on the pretty. Also, does anyone think how the kids have to schlep this mess to school? Did I HAVE to buy spray mount and foam core? Well, I didn’t want stuff falling off in the car or have it get crushed on the bus ride to school . That $20 saved me from waiting for Elmer’s glue to dry, and the $128 for toner kept me from wasting 3 hours visiting Kinkos. All this so the teacher can have something “cute” on the walls for the open house. What my kid has learned from the bulk of the trifold time wasters is layout design, material handling, font design, design flow, color harmony and time budgeting. The actual knowledge learned on the subject was minimal. I have my MFA. I’ve done my 8 years of of art projects. I takes everything in my power not to send a bill for my time and materials. My kid did do all the research on the topics and the actual writing. That should be the focus, not the insane part of the rubic for constructioning something is better left to a second year industrial design class on presentation. For all you teachers, who have the children do the projects AT SCHOOL, I could kiss you on the lips and would bump your pay by $100K. I have no problems helping my kid research. I have huge issue in projects that need a BFA in studio art to receive an A.
JW – I completely agree with you. Teachers should absolutely not grade on pretty. They should grade on what is reasonable for a child of the grade they teach to do, and more specifically, what each child is capable of. Some third graders can cut things out beautifully, some cannot. The point of this post is that the project should belong to the child, not the parent, though I realize that many teachers are grading parents, not students, so perhaps this post in irrelevant in that respect. Of course, the actual content – research, assessment or learning etc., should take precedence over the “pretty.” Ideally, these projects should be a FUN way for kids to show what they have learned. It should not be stressful for kids or parents. Teachers should go out of their way to make this clear and to give guidelines so that projects don’t spin out of control. Certainly, parents should not have to lay out large amounts of cash to facilitate their child in completing a project. I wrote this post back in 2009 – before Pinterest and Instagram. Before everything had to be perfectly lettered and covered in glitter. I appreciate your comment and it makes me think I should go back and revise this post or better yet, write a new one on student projects. I am a big believer in alternate assessments – done right, they can motivate reluctant learners, boost confidence, and work as authentic assessment tools. Done wrong…well, clearly you have shown us how that works out. I have to comment on this! When I was in elementary school we had a project where we had to make a puppet of some important person in history. I spent hours making a Rachel Carson hand puppet – the very first time I had ever made a pattern myself and sewed it all together on a sewing machine. I got to class and this girl had made an Amelia Earhart puppet worthy of Sesame Street – it had the little goggles, the little hat, scarf – she even sat in her own airplane! I think every kid walked into that room and said WOAHHH!!! out loud when they saw it. Mind blown. And all these years I seriously believed that a 5th grader had pulled that off by herself – even the propeller spun around. But I think this also highlights an unexpected consequence – the other kids who do their own work think they aren’t as talented, gifted, or smart as the kids who don’t. Reading both the post and the comments really supported me tonight after I sent my 1st grade child to bed with an incomplete project left on the dining table. The frustration in the final hours to get the project done had me trolling the internet for answers to combat my guilt! We watched videos, looked up information, and discussed the topic. However, we really did not structure our already busy week to nail it for Tomorrow. I do take full responsibility in how I structured the week, however I WILL NOT DO IT FOR HIM. I will support him by working with the teacher to turn it in after school (if approved) and by supporting our efforts in introducing and practicing some executive functioning skills. It certainly is a challenge letting go and allowing the child to take the lead. Thank you. I am an aspiring educator (of adults) myself, so I am not having a go at teachers. I very much believe in teaching children how to be self-sufficient and I am not a helicopter parent by any stretch of the imagination. I am well-educated to the master’s degree level and I would very much like my daughter to follow in my footsteps. I would also love her to stand on her own two feet in terms of her abilities and be proactive with her responsibilities at school and at home. Having said that, as a parent of a 7th grader I am noticing that the kids are light years behind where we were at that age in terms of maturity, self-sufficiency and academic knowledge. My daughter recently had a major history project to complete, and if I didn’t essentially do the work for her she would have basically handed in nothing. These kids don’t have any basic research skills. They don’t know how to do a bibliography, take point form notes or write things up in their own words. I don’t believe they know how to plan a project, conduct research or even write a coherent and properly structured paragraph. Again, I am not anti-teacher in any way, but I can’t help but feel that the education system is somehow failing our children. Perhaps technology and the end of unstructured play are also responsible for the immaturity of so many children these days as well? Maybe it is because of helicopter parenting and fewer children having chores or part-time jobs? Who knows. Maybe my daughter is just lazy and lacking in self-discipline, or perhaps she completely forgot everything her teachers taught her about research, but it definitely isn’t just her. Other kids in her class did end up handing in nothing — and we live in a fairly well-to-do upper middle class area, so it has nothing to do with socioeconomic factors. I understand that I will need to teach my daughter some of these skills myself, but I would have thought she would have learned many of them at school. In the end, I did most of the work, but I at least had her research the topics, answer questions, understand and memorize the information from the project. I also had her shadow me as “we” completed the project. Next time, I am going to go through each stage in the project and actually teach her how to do the work — things we definitely had mastered by that age. My goal is to eventually get her to be self-sufficient, although I will always be happy to provide feedback or suggestions. Part of the problem is I was absolutely swamped with my own academic work, and I didn’t really have time to help her until just before the project was due. What about parents who work long hours, don’t have the same level of education or for whom English is a second language? Who is teaching those kids these important skills? There are always two sides to a story and not every parent who completes a child’s work on their behalf is some helicopter parent afraid to allow their kids to perform poorly. Some (many perhaps?) just don’t have the skills to complete the assigned work in the first place.